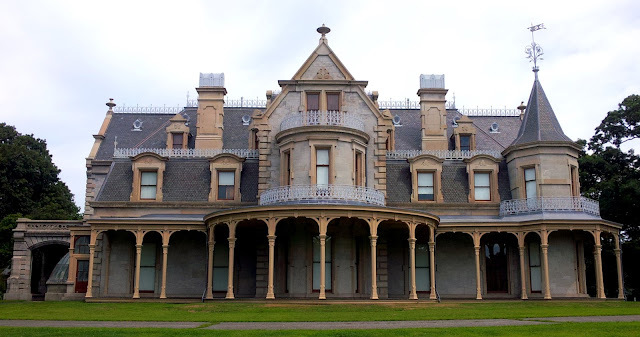 The Lockwood-Mathews Mansion is a Second Empire style country house, now a museum, in Norwalk, Connecticut. The 62-room mansion is on the National Register of Historic Places and was declared a National Historic Landmark in 1971. The estate, then called "Elm Park," was built by LeGrand Lockwood, who made his fortune in banking and the railroad industry. My great-grandmother, Isabel Hyatt, was from Norwalk and her family was well-connected to the Lockwood's. Her uncle, James W. Hyatt, worked for Lockwood and went on to a political career ending as Secretary of the US Treasury in 1884-1888. Her father, Franklin T. Hyatt, was a dentist who for more than 20 years had his office on 8 West Avenue. I am certain that all of the family knew this house intimately, and perhaps were guests of the Lockwoods. Construction began in 1864 just west of the Norwalk River in Norwalk and was completed four years later. Designed by European-trained, New York-based architect Detlef Lienau, the mansion "is considered his most significant surviving work," according to the association. Both American and immigrant artisans worked to construct and decorate the house. 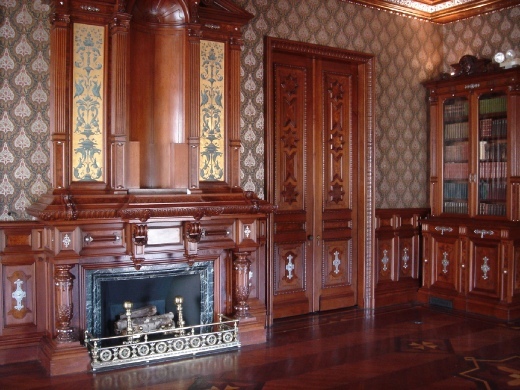 Prominent New York decorating firms, including Herter Brothers and Leon Marcotte were contracted to furnish the mansion's interiors. Stunning embossed and inlaid woodwork throughout the interiors. 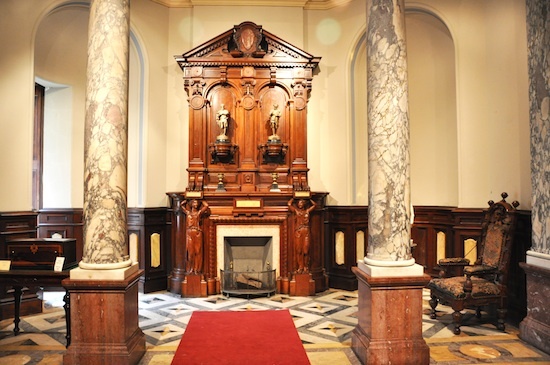 The grand staircase ballusters all have 360 degree inlays. The staircase is said to have cost $50,000 alone. Financial reversals in 1869 and Lockwood's death in 1872 resulted in loss of the estate by Lockwood's heirs. 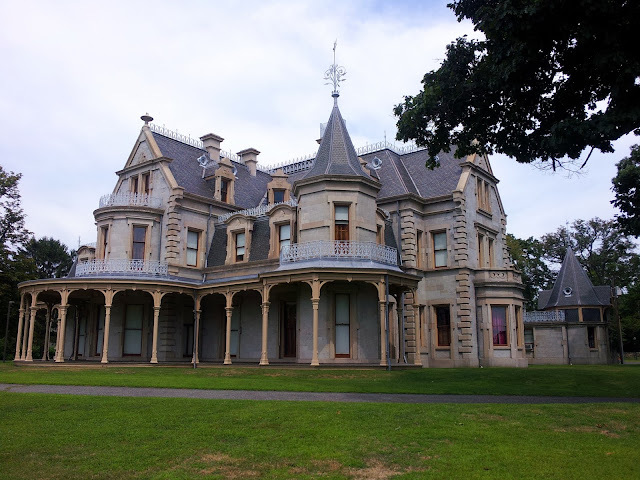 In 1874 the family lost the mansion and grounds through foreclosure. Charles D. Mathews, described in his New York Times obituary as "a very wealthy retired New-York provision dealer", and his wife, Rebecca Thompson Mathews, bought the property in 1876. The mansion was a residence and suburban retreat for the Mathews family, with their Thompson and Martin relatives, until the death of Charles's daughter Florence in 1938. In 1941 the estate was sold to the City of Norwalk, which designated it a public park. In the 1950s, the building was threatened with demolition, but local preservationists succeeded in saving it. They formed Lockwood-Mathews Mansion Museum, Inc. to run the site, which was designated a National Historic Landmark in 1971. "Progress" has taken a tremendous toll on the old city of Norwalk. The construction of I95 ranks as one of the most destructive projects ever, particularly to the once pastoral neighborhood around this house. The blasting is said to have caused significant structural damage to the mansion's upper floors. I95 continues to be a massive and perpetual problem for Connecticut that is expected to cost billions of dollars to remedy. There are many words to describe the City of Norwalk and its evolution (or de-evolution), too many for this article. My impression of contemporary Norwalk is that it has suffered, as many cities in America have, ignorance, neglect, bad planning, and rapacious commercial zoning. This building is a treasure, and it is shocking to imagine the mentality that it would take to justify its wanton demolition, for any reason.